Situated at the busy intersection of North Anderson Drive and Lang Stracht (Long Straight), the church rests upon one of the high points within the city, and has probably been passed by most people who have visited the city on account of the arterial nature of Anderson Drive. The building was constructed and dedicated in the 1960s and was the first purpose-built LDS church in Aberdeen. The walls are of red brick, regularly punctuated with white windows. The pitched roof was tiled in the 1990s; prior to this it was constructed of copper. I understand that the church was designed in Salt Lake City. Given the period, this would explain the mid-century modern feel to the exterior. The building is somewhat hidden behind a larger residential building to the south, and some trees to the north, and so it would be easily missed upon approach were it not for the tall spire. The spire, which slices-through the large front porch, ensures that the building is clearly identified as a place of worship. A moderately-sized plaque on the front wall is all that indicates that this is an LDS church. I have been fascinated by this building for many years: since I was a child in fact. I particularly relish the colour palette and textures of the building within its surroundings: the green, red, blue and white, the brick, concrete and stone. The St. Andrew Street building of the Robert Gordon University (RGU), as it was known, was constructed from granite in around 1908, and is centrally placed within Aberdeen in the Woolmanhill area of the city. The building is trapezoidal in shape and occupies a whole city block. The main entrance is situated in the centre of the south face on St. Andrew Street (hence the name). However, there are secondary entrances on the remaining elevations of the premises. The site contains a central courtyard which was, over time, developed into a car park, library and a hall. Vehicular access is via two pends on the north face. The building has lain unused since the university relocated to the Garthdee site, and was sold to the Sandman Hotel Group in 2014 for development into a four star hotel. As of October 2016, this renovation appears to be underway, with scaffolding cladding the west elevation. Unfortunately, the demand in the city for additional hotel space seems particularly weak a present as a result of the current decline in the oil industry. The St. Andrew Street premises was home to the Aberdeen College of Education until the 1960s. Latterly, it housed the RGU schools of sciences and computing. It has been said that the various elevations of the building display varying architectural merits: the south being the most significant. It is certainly the most inspiring to view in my opinion. The image above shows the area immediately above the south entrance on St. Andrew Street: the view most building users would have been greeted by upon approach. I have a personal connection to the building: I studied at RGU during the 1990s, and spend many hours within the library, lecture theatres and laboratories. I have very fond memories of the place. It was an establishment of learning, for sure. However, it was also somewhere to meet and socialise with fellow students. I am glad that the building is not going to be razed, but instead repurposed: it would be a tremendous shame to lose such a large and significant granite building from the city. However, even as I write, the future of the city and her inhabitants hangs in the balance. Corrine Krisel and Twin Palms tract house (1957). Photograph by Julius Schulman. Getty Research Institute, Los Angeles (2004.R.10). Copyright J. Paul Getty Trust. I recently bought this book as I was already a fan of Midcentury Modern design, and of the photographer, Darren Bradley, who contributed many fantastic images to the publication. I admit that, prior to reading, I was unfamiliar with the life and works of the prolific architect and landscape designer William Krisel, on whom the book is based. Krisel’s professional career has extended from the 1950s onwards and during that time it is estimated that he has designed more than 30,000 homes in Southern California including Palm Springs and the Coachella Valley. Part of Krisel’s genius, in my opinion, is that he has been able to take relatively similar designs and modify them in such a way as to make neighbouring homes appear unique through the use of different roofing styles, colour schemes, landscapes and building orientations. This is particularly significant given that Krisel’s focus was mainly on so called “tract” homes built on estates. Prior to Krisel, such estates would have been created with “cookie-cutter” homes: rows upon rows of the same repetitive and monotonous buildings. Krisel broke that mould. Nowhere is this more apparent than in the Sandpiper estate of Palm Desert. These homes were arranged in a circle around a central pool area. Very communal. However each of the properties was still able to retain its own privacy. Modernism is a philosophy that creates a better way of living through design. It improves one’s appreciation of design and ecology. The images throughout the book are provided by a number of photographers. In particular I’m drawn to the “old” versus the “new” images of Southern California. The historical images were mostly created by, the now late, Julius Shulman. Many of the modern images were provided by the equally talented Darren Bradley. Whilst the Shulman images mainly capture the scenes in his signature black and white style, Bradley’s are bright, vivid and beautifully contrasted. William Krisel’s Palm Springs – The Language of Modernism was edited by Chris Menrad and Heidi Creighton, both enthusiastic followers of Modernism. Other individuals have contributed photographs, chapters, anecdotes and interviews to the book which ultimately provides a wonderful insight into the life of this pioneer, who is truly under-appreciated outwith Southern California. The Robert Gordon University campus is located at Garthdee in Aberdeen (here). The whole site is constructed on a hill leading-down from the street towards the river Dee. The buildings pictured above are constructed into the hillside with sweeping curved roofs following the downward gradient. I’ve been passing this spot for some time now and I have debated about how I want to capture it: there are many metallic surfaces in this perspective, and so on clear sunny days the cluster of buildings are too bright and contrasty. I therefore decided to wait until later in the day when the sun was lower in the sky, and there was some defined cloud cover. I was looking for something more low-key. I was particularly interested in the repeating lines of the Aberdeen Business School’s curved roof and the wall of the Sports Centre. The light that day cast a nice gradient on both. The Sports Centre panels reminded me of a gray-scale colour chart. I shall post more shots from RGU in the near future, as there are plenty more perspectives to explore. The library is situated on the western edge of the University of Aberdeen’s King’s College campus. It was completed in 2012, and built to replace the Queen Mother Library which sat directly south of it on the same site (to the right hand side in the image). The original library had been built in 1965 and then subsequently extended in 1978 and then again in 1982. However, it was never designed for the large number of visitors that it served, and so a replacement was sought. The architects Schmidt Hammer Lassen won the project to commission the new space. The Sir Duncan Rice building is a simple cube from the outside, clad in an irregular pattern of insulated glazing. The glazed surface appears to float above ground level. The dark panels are transparent, the lighter ones are not. On the north side, glass elevators rise to each of the floors. From within each there is an unobstructed view of St. Machar Drive and the University’s Zoology building. From the centre of the ground floor looking upwards, irregular curved cut-outs on each of the floors create an atrium that extends towards the sky for a breathtaking view. My image does not allude to the sheer boldness of the architects who have designed a piece which sits within the grounds of an ancient university. The library is a mere stones-throw away from King’s College which was built around the year 1500. In fact the two buildings are visible to each other. Just a few hundred yards and 400 years apart. Julius Shulman (1910 – 2009) was a midcentury Modern architectural photographer based in California. His vast collection of images document the changes to the built environment, mainly in Los Angeles, throughout the 20th century. 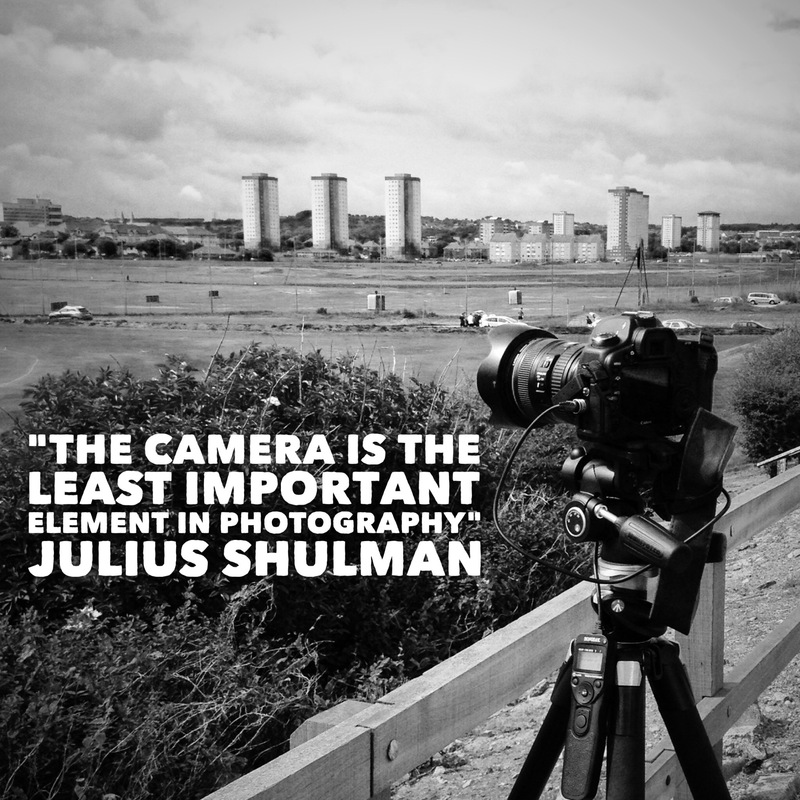 Julius’ words serve to keep my desire for new photographic equipment in check at all times. Thank you: you’re saving me a fortune! The Rowett Institute was formed in 1913, and was built in the Craibstone area on the outskirts of Aberdeen city. Its original purpose was to research animal nutrition. This was later extended at the stipulation of its benefactor and namesake, Dr. John Quiller Rowett, to include research on human nutrition. The institute formally merged with Aberdeen University in 2008 whilst still based at its premises to the south side of Dyce airport, and was renamed The Rowett Institute of Nutrition and Health (RINH). In March 2016, the institute relocated to its new custom-built home on the Foresterhill site (designed by Halliday Fraser Munro), where it now continues its work in the heart of the North East’s premier health campus. The building sits adjacent to both the Institute of Medical Sciences and the Suttie Centre, to the north of the campus. All three buildings have their own character, and all have been built within the last decade. This demonstrates Aberdeen’s commitment to continue to be a world leader in medical research. The Rowett building itself appears to be, at its most basic, a rectangular cuboid with a twist! The main structure is clad with an intricate exoskeleton of vertical and horizontal beams, as can be seen in the image above. The institute was originally concerned with issues surrounding malnutrition. In modern times there is a much greater emphasis on the overconsumption of food! How times have changed! More information on the institute’s fascinating research, and how to volunteer to be included in one of their studies, can be found here. I took this mono image of the city from the Torry Battery whilst scouting a location for an upcoming photo shoot. As I took-in the view, I noticed that the image captures a number of features of the city. There are elements of the old: the intricate towers in the centre of the frame are Marischal College and the Citadel. To the left of these are the three cranes used in the construction of the new Marischal Square development – a project that has split the opinions of the city’s residents. In the left of the foreground is Footdee (“Fittie”), a small fishing village based at the mouth of the river Dee. The large, imposing tower in Fittie is the Marine Operations Centre. Fishing and the sea are of great importance to the city. The view is built-up in layers as a result of the light fog, which makes for a sense of depth. Continuing with the theme of seating, this image is taken from a series I captured in February 2016 as part of a shoot for a designer friend of mine. He was looking for some new portraits of himself for his website and we stumbled-upon this piece whilst scouting for a location. Following a query from a follower on Instagram, I decided to take a further look into this beautifully simple sofa and found that it is a Hitch Mylius design. Hitch Mylius has been producing quality furniture in London since the early 1970s, and has grown from strength to strength in the intervening years. A number of the original designs are still in production today, such is their iconic quality. See Hitch Mylius’ website here for some awe-inspiring colours and sleek designs. Located near the entrance to the old Scott Sutherland School of Architecture at The Robert Gordon University in Aberdeen, this concrete armchair is presented in the style of Le Corbusier’s LC2 chair: a classic design which has been often copied. I really love the weathered texture and the leaves growing from the seat “cushion” in this example. The School has now relocated to a brand new facility within the Sir Duncan Rice Building, a little further east on the campus along the banks of the river Dee, and is certainly worth visiting. I’m looking forward to the end of year show in June. Details available here. The event will showcase the work of the degree and masters graduates, and will be fascinatingly insightful – I’m certain of that.